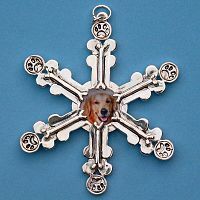 - This Dog Snowflake Theme Ornament has a place in the center to put your dog's picture. It is so cute with six spokes of dog bones stacked and six paw prints. 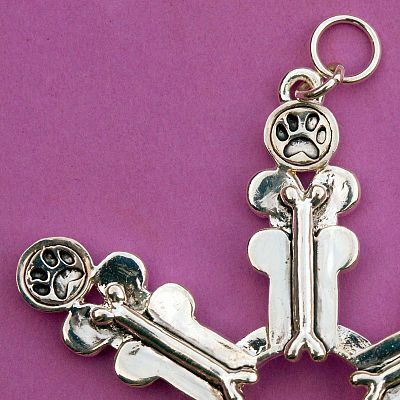 Having your loyal dog's picture inside will make this a special keepsake. This item is about 3"X3". Do you have any other questions about our Dog Lover's Snowflake Ornament? This is a really great ornament picture is not as bright as the actual. I am going to enjoy having this on my tree. When our family dog passed last Thanksgiving I was looking for the perfect way to remember him. With this on the tree we will always remember what an amazing dog he was, and how very much we love him. The quality is excellent on this ornament. It has a nice weight to it and the workmanship is excellent. The spot for the picture is very small so it will take a while to find a picture to fit but I wasn't expecting it to be huge either. About an inch or half inch I would say.